Most of us search for ways to make extra money online or offline which don’t require any expertise. Because sometimes we want to earn money quick without having any special skills. Having an extra source of income can be great in many ways like; funds for emergencies or getting out of debt or simply having more financial security. With so many money-making options on the web, it is confusing to choose the legitimate ones. Do you know that you can get free products online for your opinion? Yes, you can!! Companies are always looking for a genuine opinion from consumers regarding their products. In return for your opinion, you can get paid in cash or get free products. How much you earn is dependent on the company, but roughly you can make anywhere from $5 to 50. You can apply for such opportunities at places like PineCone Research, TolunaSurveys, American Consumer Opinion. Smartphone apps are a booming industry now, and developers need the apps to be reviewed before they are released into the market. Just like testing websites, you get paid to test apps. The nature of work is almost similar to site testing, and you have to give your honest opinion about the app. Websites like Usertesting.com and Elusivestars.com have app testing opportunities. Reviewing apps with Usertesting pays around $10 per test. Airbnb is another fun way to make extra money every month. If you have a spare room, then you can become an Airbnb host and make money. According to this report, an average Airbnb host makes around $924 per month. That’s a lot of extra money! Being an Airbnb host can be very rewarding because most of the travelers now are using Airbnb accommodations. Why waste an extra space in your house, when you can make some extra money from it? Just sign up and earn passive income! Reward Sites or GPT Sites are those who give you reward or gift cards in return for tasks like watching videos, reading emails, doing surveys etc. There are many reward sites which I recommend, but the main ones are Swagbucks, InboxDollars and CashCrate. I have earned good extra cash many times with Swagbucks. As these reward sites offer many tasks other than surveys, you can quickly add up the money. You can make good side income with these, find out how you can make around $1000/month mostly with GPT sites. 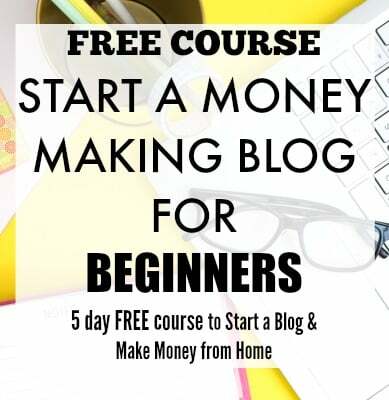 Blogging is an excellent way to make extra income entirely online, and the best part is that it is quite flexible, and you can do it along with a full-time job. It needs as much hard work as any other job but the income and flexibility are the best. I am making around $4000 a month blogging part-time, and I highly recommend it to anyone looking for extra income online. It does not require any special skills or expertise, and you can start a blog for a price as low as $2.95/month . Plus you get a FREE domain when you sign up for a 12 month basic plan. That’s a small price when compared to the potential earning from your blog. I frankly never knew that you could make so much money with flipping cheap items. Melissa made around $40,000 last year flipping part time, you can too. If you want a fun way to make money online and you have an eye for finding cheap things, then look into flipping. Ok, till now I have been asked about virtual assisting so many times that now I know it’s going to boom in the coming years. Virtual assisting is one such job where you can do various kinds of tasks such as admin work, email support, marketing or even just making appointments. You can earn a significant income by being a virtual assistant, and it is entirely flexible. As a beginner VA you can make around $35 an hour. The online marketplaces like Amazon, eBay, AliExpress give an excellent chance of making money from home. You can have an online e-commerce store and earn money from the affiliate sales. 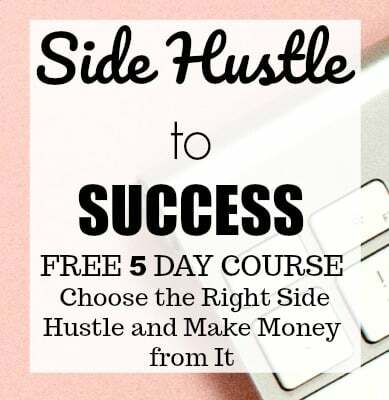 The best part about this side business is that you don’t hold any inventory/stock and still make money, and this is another super profitable way to make money online. Jenn of Drink Coffee and Prosper earns over $10,000 with her e-commerce store. Do you like shopping? I am sure you do. This is an awesome way to shop and get paid for it. Mystery shopping is one such hustle where you make money going on shopping gigs. You can find out everything about mystery shopping right from how much it pays to where to find mystery shopping gigs in this post. Most of the mystery shopping companies pay around $5 to 20 per call or visit. Amazon Mechanical Turk is another option to make extra money on the side. You just need to sign up for MTurk, and you have to complete the tasks that are available on your dashboard. There are many tasks right from writing, rating images, data entry, so it mainly does not require any particular skill at all. But do keep in mind that these tasks may pay very low, so try to choose the ones where you can earn well. Giving your opinion for gift cards or cash is a quick cash earner. Surveys like VIP Voice, Harris Poll Online, Swagbucks, Survey Junkie are some of the legitimate survey panels worth your time. Anybody can do this, but you do have to remember that there are many scams out there, so choose the legitimate research panels and start earning gift cards. Also sign up for many panels to get invited to more surveys. Do bear in mind that you will not be making much, but they can be good extra cash income earners. You can make anywhere from $100 to 300 from surveys, if you sign up for most of them. If you love driving, then you can make some extra dollars in your free time as a Uber driver-partner. It is very flexible, and you make a good part-time income from it. Though this is not an online option, it can be an excellent addition to your income. Sign up for Uber here. Testing sites does not require any technical skills. It is quite easy to get the hang of this side hustle, and you can make good extra cash with testing web sites. There are many companies which need usability testers, and with so many new websites coming up every day, there will not be a shortage of tasks for this job. The pay is usually around $10 per test. You can make some extra cash selling old books online. It can be a very easy process without the hassle of looking for the buyers with flexible apps like BookScouter. This is the most convenient app to sell your used books online. Check out more about this excellent opportunity here. The amount you earn depends on the quality of books. Are you a bookworm? Then, you can get paid in cash or get free books for reviewing books. There are companies which pay you to review books. You can look for book reviewing opportunities in websites like Contena, Kirkus and Online Book Club. I can say for sure you don’t need any expertise for this. Search Engine Evaluation is nothing but rating the results of search engines following some guidelines. Being a Search Engine Evaluator is an excellent work-at-home option, and anyone can do it. You can earn around $1200 per month depending on the hours you are given. You can make a good side income being a chat agent. This role does not require any special skills except for a pleasant demeanor and a zeal to help the customers. Many big businesses have websites, and they need chat agents to help their website visitors with any queries that they may have. You can apply for chat agents positions with companies like Needle, Metaverse Modsquad, Arise, Talk 2 Rep. On average many companies pay $10 per hour. Moderating forums and chat rooms is another way to make extra income online. These online communities need moderators to maintain the community rules and do the tasks like settle any disputes and continue the proper functioning of the community. The usual pay is around $10 to 15 an hour. You can be a moderator without any prior experience or special skill. Apply for these roles with companies like eModeration, ICUC, LiveWorld. Did you know that you can earn money while you shop? You can make quick cash when you download Shop Tracker and can continue making money if you keep the app installed. You just need to connect the app to your Amazon account and start making money while you shop. Download Shop Tracker and get $3 right now. Work-at-home customer care is a very in-demand niche. There are many companies which offer completely remote customer care positions. As with the usual customer care position, they don’t require many skills except for basic admin skills and helpful attitude towards customers. You earn around $8 to 15 an hour. Here is a list of companies which offer online customer care positions. If you are a social media junkie, then you have an excellent way to make some extra cash. Use websites like Izea to utilize your social media presence to make money online. All you have to do is that connect your social media profiles after you log in and you get invited to bid on campaigns from different brands. The stronger your social media presence is, the more opportunities you get. The pay per campaigns starts from $1 and it totally depends on your reach. Installing apps is probably the easiest way to make money online. You get paid to install new apps or just slide your phone screen or tablet. There are many apps like Fronto, SlideJoy, Perkscreen, TapCash, FeaturePoints, etc. The money you earn may not be much, but it’s a fun way to make some extra bucks on the side. You can earn some extra cash doing micro tasks with companies like Clickworker and Crowdsource. The work you do is tasks like data tagging, short transcription and writing gigs. These tasks pay very low like around $1 or more, but they do add up. Like you sell your old books, you can also sell your old clothes. Why not declutter your wardrobe by selling old clothes and make some extra cash on the side. Here are some websites which you can use to sell your clothes – Poshmark, thredUP, eBay and Tradesy. Teaching English online is one of the most flexible and profitable ways to make money online. If you have native English speaking proficiency, then you can start teaching spoken English through apps like Palfish and Nicetalk. You get $10 per hour through Nicetalk. VIPKID is another company which lets you teach conversational English to Chinese kids. You can have any formal or informal teaching experience. The pay is $14-$22 per hour and the flexibility is great. Do you spend hours on your laptop searching for things online? Then you have a way to make money from this. You can become a freelance researcher. You don’t need any special skills for this role apart from being thorough with your researching skills. You can apply for a freelance researcher with Wonder.com. On average you can get between $8 to $15. There are many useful apps which give you cash back on your day to day purchases. It’s an awesome way to earn back some money while you shop for your necessities. There are many websites like Ebates, Ibotta and Checkout51 and the cool part is that you get bonuses for signing up for Ebates and Ibotta. I love photography and would like to sell my photos some day. With the so many brands of smartphones, taking high-quality photos is easy these days, and the best part is that you can sell these photos online. Use websites like Snapwire, Foap, IconZoomer to start making money from your smartphone. You can earn anywhere from $3 to $100 per photo. I know you might be thinking this job might be for accountants or people with experience in bookkeeping. It’s not. You can be a work-at-home bookkeeper without any experience. Bookkeeper is a perfect online work option giving you extra income. If this is something you are looking for, then check out this detailed post about Bookkeeping. Wow!! That’s a big list. Most of these are additional income ways you can do online along with your job, and they don’t need any prior experience in any field. 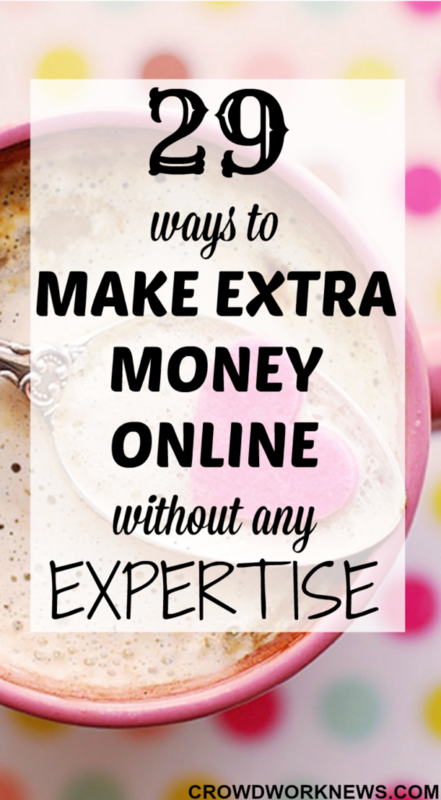 You can make extra money without expertise! Just remember, finding the right option is the key to it. If you are just looking for extra income, then doing online surveys or side gigs is great for you. If you want more than side cash then go for jobs like search engine evaluation or freelance researching. Having more than one stream of income is always the key to a better financial system. Dive into this list and try them out to start your multiple income streams. Hi! Here’s my question about blogging as a way to make money. My blogging passion lies in entertainment and pop culture, not life tips and recipes. I feel like there’s no real way to make money outside of the tip-heavy blog topics. Any thoughts? You can definitely blog about your topics, entertainment and pop culture are quite hot topics. On the other hand, it is possible to make money with blog topics around tips, though this area is quite saturated. The biggest thing that matters is how you give a new prespective to the topic. Hi Sireesha, Thanks a lot for putting all this together. Very good content and easy to understand. I would like to one more idea to make money. If someone is good cook they can definitely make money hosting dining events or authentic cuisine events at their house. Thank you! That’s a great idea to earn extra income.